As a cruciferous vegetable, cauliflower is known to help the liver process toxins. 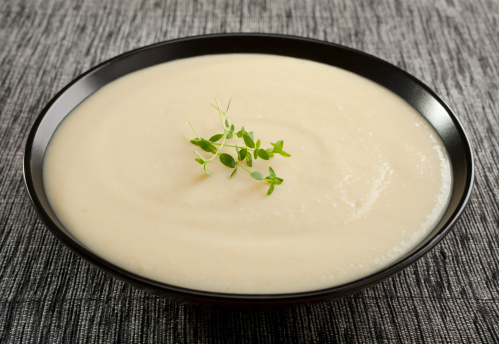 This creamy cauliflower potato soup is a flavorful bowl-full of liver love. In a large stock or soup pot on low heat, sauté the onions and garlic in the olive oil until onions are tender. Add potatoes and cauliflower and mix for several minutes. Stir in the 3 cups of liquid of your choice, rosemary and cayenne pepper. Cover the pot and allow to simmer for 20-25 minutes, or until potatoes are soft. Remove soup from heat and using a hand-held blender, mix the mixture until it is creamy. Without a hand-held blender, simply pour the mixture into a traditional blender and blend until smooth. Pour the soup into bowls and top with sunflower seed kernels, cracked black pepper, ground nutmeg, and/or green onion rings as desired.